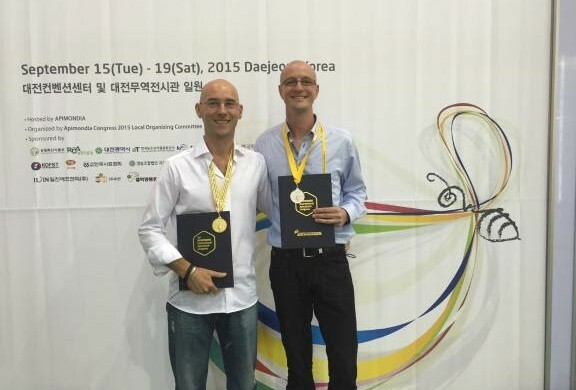 Two Danish beekeepers, Lars Fischer and Zofuz Knudsen, showed that Denmark can produce world-class honey at the 2015 Apimondia beekeeping world congress held in Daejeon, South Korea. Competing against entries from 114 other nations, the pair won first prize at the congress for their hard honey and second place for their liquid honey. The pair aren’t strangers to winning prizes – last year they won the best honey title at the International Food Contest in Herning. “Danish beekeepers make really good honey and have a tradition for doing so using gentle methods,” said Rune Havgaard Sørensen, the secretariat head of the national beekeeper association Danmarks Biavlerforening. The honeys were judged by an international panel for their taste, appearance and texture and also underwent considerable laboratory analysis ahead of the competition to ascertain their purity. Fischer and Knudsen weren’t the only Danes to walk away with some silverware. The south-Jutland company Swienty, which sells beekeeping materials, won third place in the competition for innovation. They won the prize for a new apparatus that measures Varroa destructor mites – the parasite with the most pronounced economic impact on the beekeeping industry – and makes it easier for beekeepers to reduce the number of attacks.